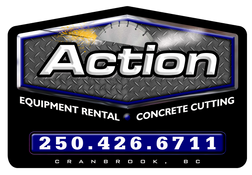 For over 40 years, Action Equipment Rentals Ltd. has been your source for heavy equipment and tool rentals in the Cranbrook region. We offer assistance to homeowners and contractors from Creston to Fernie. Whether you require a mini excavator, scaffolding or concrete cutting, we have the products and resources you need. Stop by today to browse our selection. While you’re here, why not get your car washed at one of our convenient coin-operated bays. Do you have any questions or comments about our business? Feel free to fill in the e-form on this page. We look forward to hearing from you.